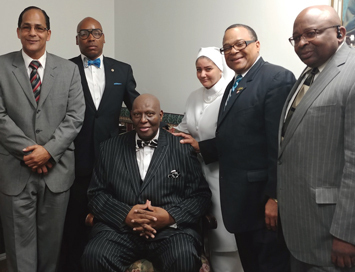 PHILADELPHIA—The Delaware Valley Region was blessed to host the Honorable Minister Louis Farrakhan’s Student National Prison Reform Minister Abdullah Muhammad, who was invited into the region by Student Regional Minister Rodney Muhammad. Minister Rodney is also the president of the Philadelphia NAACP Chapter. He sponsored a criminal justice forum that included several presenters, including Pam Africa, director of International Family and Friends of Mumia Abu-Jamal. The criminal justice forum was held the evening of April 13 at the Church of the Advocate in North Philadelphia. Brother Calvin continued, “Minister Abdullah covered points of interest with grace and tactfulness as he addressed the men. Everyone sat in rapt expectation and Brother Abdullah didn’t disappoint anyone. Like any small life form, we are struggling for balance. Great potential exists here as latent energy. The will and desire to broadcast one’s ideas and sentiments can be misunderstood within a small group. Minister Abdullah never missed a beat as he opened in the name of Allah, His Messenger Messiah, and the Honorable Minister Louis Farrakhan, sharing his personal experiences with Minister Farrakhan as the Minister started rebuilding the work of the Most Honorable Elijah Muhammad. There were about 20 prisoners in attendance to hear Brother Abdullah at a last minute announcement that he would be inside of the prison. Student National Prison Reform Minister Abdullah demonstrated to us the manner of a man, Min. Farrakhan. He described the “anointing,” of Min. Farrakhan, to say, two are backing him, Master Fard Muhammad and the Most Honorable Elijah Muhammad. It was a blessed weekend for the Delaware Valley Region with the presence of Brother Abdullah Muhammad.